My daughter is really into sewing at the moment! Teaching kids to sew is a great life skill and we are always looking for new patterns and ideas for her to sew. 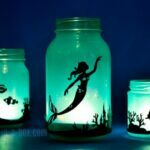 As you may have noticed we are going through a bit of a DIY Mermaid Crafts phase right now.. it is has been rather magical in our house.. and one mermaid craft seems to have sparked off the next. One weekend, my daughter had a “Mummy Weekend” (as the “Boys” went away on a Rugby Tour) and when asked what she would like to do, she clearly stated “can we make those mermaids now”. Ah. So we did. 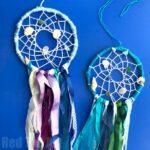 A trip to the local sewing shop first to pick fabrics and maybe check out the wool and the project DIY Mermaid Dolls began. 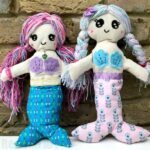 We actually made three mermaid dolls that weekend – two Mermaid Rag Dolls (coming soon) and one little Felt Mermaid Doll. 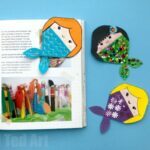 The mermaid rag dolls gave Pip Squeak (8) the opportunity to practice on the sewing machine and then we created an easy Felt Mermaid Doll Pattern for some hand sewing. This pattern is very much a “together project” – I will indicate who sewed what where…. Joining in with Sew a Softie Month orgaised by Coloured Buttons! See all the websites participating here! 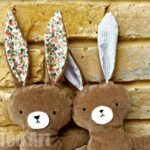 Why not sign up to our newsletter and get more free crafts (and patterns) straight to your inbox? 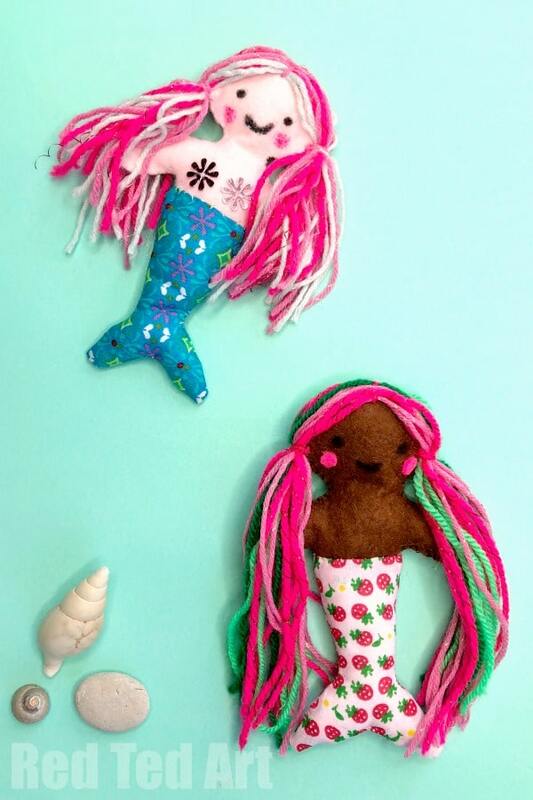 PLEASE NOTE: I took the step by step mermaid doll how to photos as part of a “working session” with my daughter. When we started sewing I had no intention of blogging it.. but decided to take some images anyway. They are not perfect…. the emphasis was on working together and not to get photos! So they are by no means perfect. But hopefully still helpful! Begin by cutting two body parts and two mermaid tail parts. 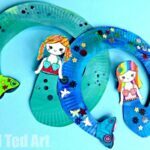 If you are using fabric with a pattern – consider how the pattern should “run” down or across your mermaid’s tail. 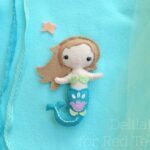 NOTE: The seam allowance on the mermaid’s tail is very small – about 0.4cm – if you need a bigger seam allowance, but the tail a little bigger! I did thi spart of Pip Squeak as you need to be accurate! 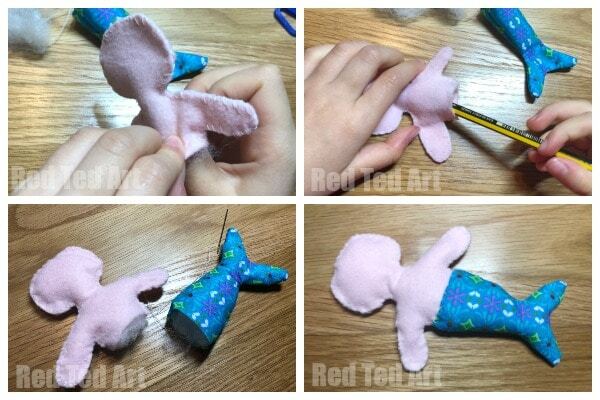 We loved this part – Pip Squeak sewed the body with an over stitch WHILST is sewed the tail with a back stitch. It took us about the same time! For the body – put the right sides “out” and sew all around your body. You will see the stitches but it is part of the design. 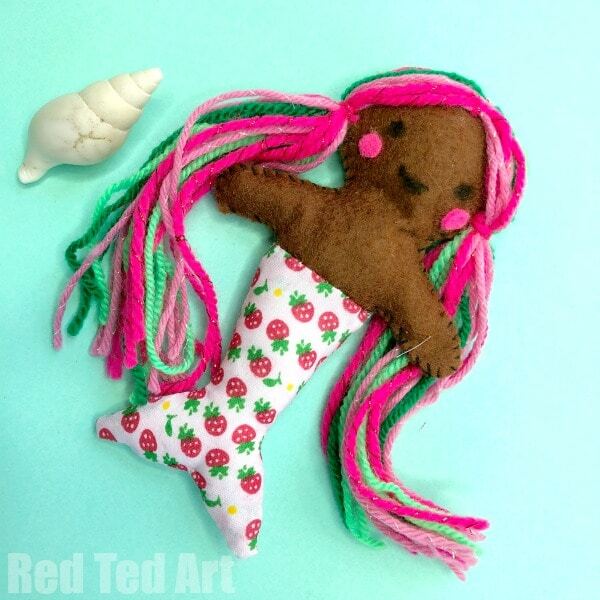 For the mermaid doll’s tail, put the fabric right side together and sew a 0.4 cm seam all around it. CHECK the top of your seam against the mermaid’s body – ie the body needs to be able to slide in. If the seam allowance is too small for you – cut a slightly bigger tail from the pattern. Once sewn, snip the corners for easier turning. 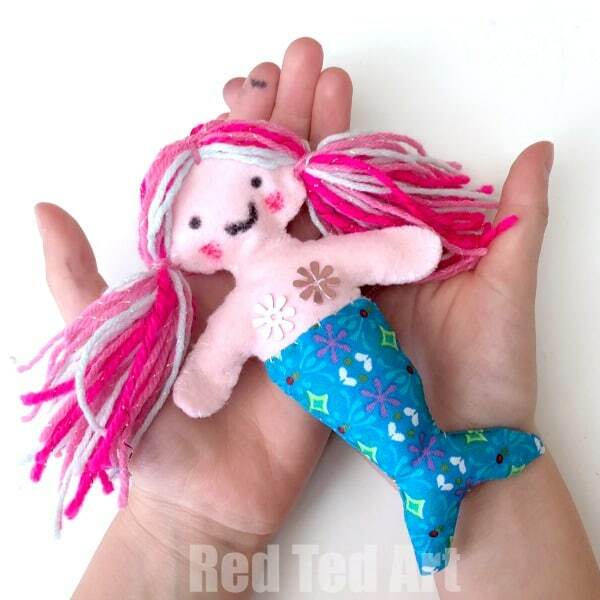 You can sew the mermaid’s tail with felt – in this case – out the right sides OUT together and again using an over stitch sew all around the outside. The mermaid’s body still needs to slide in at the top. But it should be easier. Turn your tail right side round. You may need a pencil to push all the corners out. I sometimes use a needle to get the final corners out. Stuff your mermaid’s body and mermaid’s tail. This is a little fiddly now – but managable – fold the top of the mermaid’s tail in – to give a neat eadge – only about 0.5cm. Then insert the mermaid’s doll body. Now sew around this edge with a ladder stitch. If you are not comfortable using a ladder stitch, a running stitch is fine too! Cut 20-30 strands of hair from your wool – we used bright multi coloured wool! So lovely. The length of the wool is totally up to you.. and depends on how long you want the hair to be. On one of our dolls ours is approximately 30cm long. Place the wool flat on the table. Position the doll over it. When you know where you want the bunches to be, tie them with some addition wool. 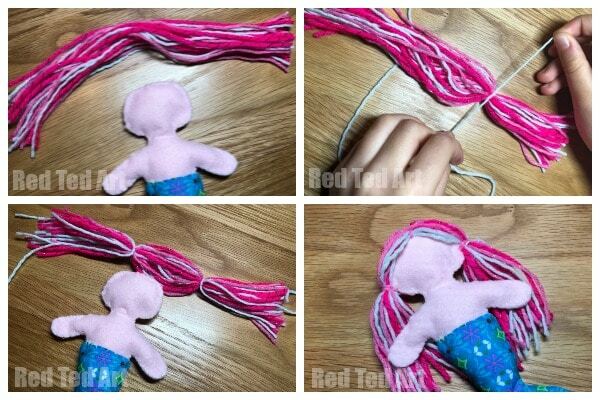 Then using more wool, sew the hair pieces to the head – creating a centre parting with your seam. Finally, sew the “bunches” to the side of the head. Now you can add the finishing touches. 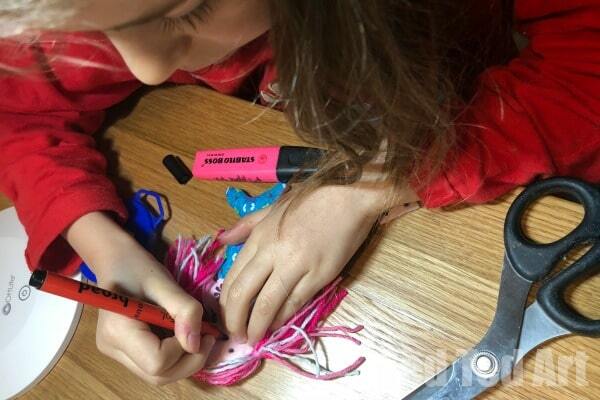 We used pens to add the face on one doll.. and pens and a little felt for the second doll. You can of course sew the face on too (e.g. using a french knot for eyes). 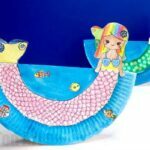 Finally, if you wish, you can also use sequence to sew on a Mermaid’s Bra/ Top. I think they look cute with or without!!! 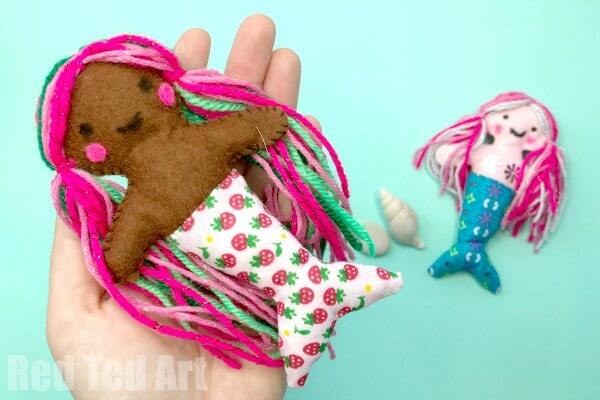 Your DIY Felt Mermaid Doll is FINISHED! 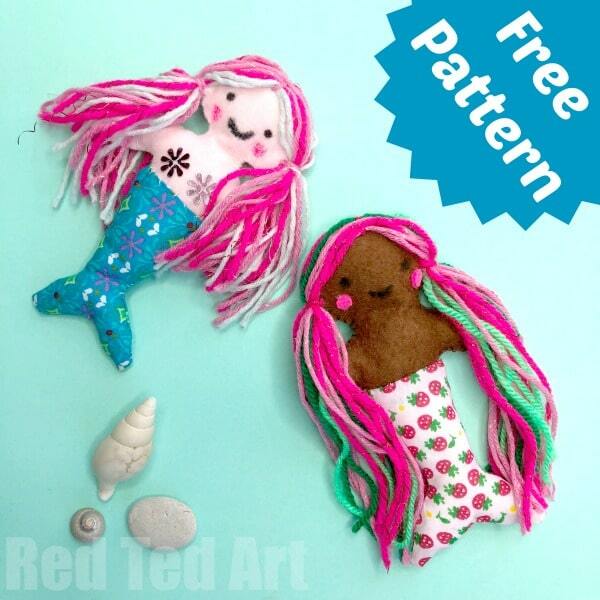 I do hope you like our Free Felt Mermaid Doll Pattern!!!! OH MY Goodness! These are adorable! What a good start to the Sew a Softie! Awwww thank you! So pleased you like them! Can’t wait to see all the other creations! My daughter would have loved these when she was little, She was a big fan of some mermaid books, I can’t remember the name now. 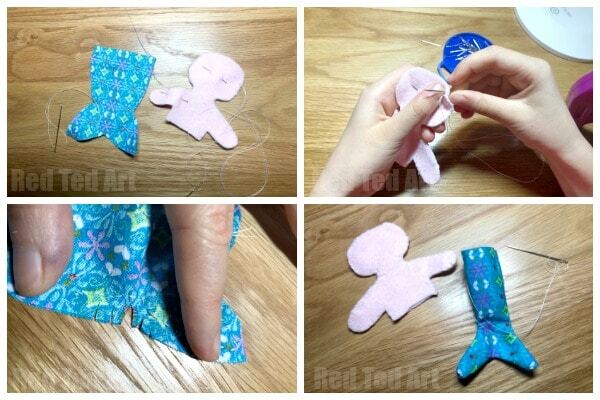 I love the sew a softie idea, there’s nothing quite like a toy you’ve made for yourself. Awww thanks for the loely comment!